Enjoy the best flavors of summer by the spoonful with this Watermelon Tomato Gazpacho, a sweet and savory twist on the classic summer soup. One of my daughters is a self-declared “soup girl” and I’m with her 100 percent. I could eat soup all year round, even on the hottest days of summer, but most people I know don’t agree. They want cold foods on 90+ degree days, which is why gazpacho, a classic cold summer soup, is so popular on restaurant menus this time of year. Despite my love of soup, I wasn’t always a gazpacho fan. It probably stems from the fact that my mother never made cold soup – to this day she and my father still aren’t into the cold soup trend. Here’s a perfect example of how role modeling really does influence children’s food choices. But that’s not what this post is about. 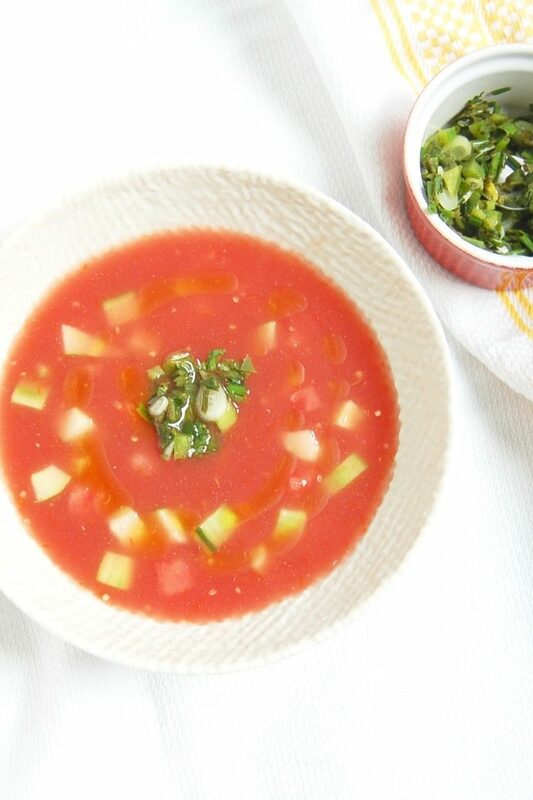 This post is about the most delicious summer soup – my Watermelon Tomato Gazpacho. Luckily, I figured out the pleasures of cold soups on my own, and once I did I had to make it at home. Most people are familiar with traditional tomato-based gazpacho made of fresh tomatoes, onions, and garlic. Sometimes bell peppers and cucumbers are added as well. As you probably realize, I’m not one to stick with the classic pairings. Just take a look at my Peach Panzanella Salad for one example. My homemade gazpacho recipe is another. Sweet and savory flavor pairings are my favorite and it makes perfect sense to add watermelon to a summer soup since its prime season for this fruit. Plus, like tomatoes, watermelon has a really high water content. My Watermelon Tomato Gazpacho also has cucumbers, another water-rich veggie that’s at its prime in the summer. I originally posted this Watermelon Tomato on the blog in 2013, but over the years I’ve updated the recipe and my preparation of it. The biggest change I made to the recipe is that I use all the ingredients completely raw, which is really how gazpacho should be made. When I first made this Watermelon Tomato Gazpacho I roasted the tomatoes, peeled them, and strained the juice, leaving behind the seeds so the soup would be as smooth as possible. The extra steps of roasting, waiting for the tomatoes to cool, and straining them added a lot of time to what’s supposed to be a quick recipe. Not to mention that I had to turn the oven on – who wants to do that in the summer?! 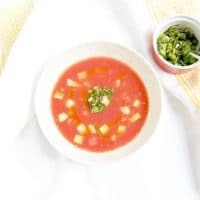 With the modifications I’ve made, this Watermelon Tomato Gazpacho is one of the easiest summer recipes you’ll find, plus it can be made ahead. The most time-consuming part is dicing up the veggies and fruit, but if you’re like me and enjoy the garden-fresh smells of summer produce, you won’t mind it at all (especially if you sneak some tastes while you’re at it!). Some gazpachos are on the chunky side, but I prefer making a smooth puree and then adding in some pieces of tomato, watermelon, and cucumber for a balance of textures in every bite. Acid from lime juice and vinegar add some depth of flavor and a heavier than usual hand with coarse salt balances it all out. Like most soup, gazpacho is best after it rests for a while after making it, allowing the flavors to meld. For this reason, you’ll notice I specify “to taste” or give a range of amounts for the lime juice, vinegar, and salt. You want to start with less, let it rest, and taste before adding more. I like to garnish my Watermelon Tomato Gazpacho with a drizzle of high quality olive oil and a small spoonful of a relish made of scallions, cilantro, and chives, with a hint of spice from jalapeño peppers. You can easily leave the relish off, as I do for my kids, but I happen to like the additional flavors, bit of a kick, and mouthfeel of the relish. 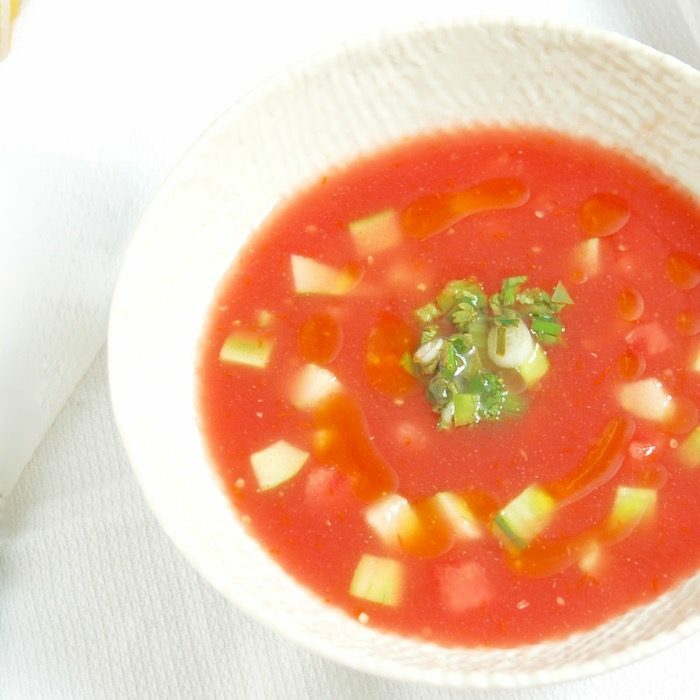 I have served this gazpacho for company on various occasions, and despite my thinking that kids would like it because all kids like watermelon (although lately not one of mine), it wasn’t a hit with anyone’s children except for my own (even the one who isn’t so into watermelon this summer!). But remember – I didn’t like gazpacho as a kid either. If you enjoy gazpacho and eat it with your kids, they may come up with their own recipe when they get older too! Watermelon, tomatoes, and cucumbers are pureed into this sweet and savory cold soup that highlights the best flavors of summer. Top with a relish of scallions, cilantro, chives, and jalapeño and a drizzle of olive oil. In a large blender or food processor, puree roughly chopped tomatoes, cubed watermelon, and roughly chopped cucumber until smooth. Puree in batches if blender or food processor is not big enough. Transfer gazpacho to a large bowl or soup pot. Stir in the diced watermelon and cucumber, lime juice, white wine vinegar, and salt. Refrigerate at least one hour or overnight. Before serving, taste and add more vinegar and/or salt as needed, to taste. Before serving, mix scallions, jalapeño, cilantro, chives, and lime juice in a small bowl. Season with salt, to taste. To serve, ladle the gazpacho into bowl, drizzle with olive oil, and top with a teaspoon of the scallion-cilantro relish. *You will need about 10 pounds of watermelon for this recipe. Gazpacho can be made the night before and will keep in the refrigerator for two to three days. Do you like gazpacho in the summer? Have your kids tried it? I’m a HUGE fan of gazpacho AND watermelon! This looks perfect and refreshing. You will love this then Rachel! Hope you get to make it before the summer is over! I’m a huge watermelon gazpacho fan! The relish on top sounds amazing too. I could use a big bowl of this today. It’s so good!!! Hope you get to make it before summer ends! This sounds so refreshing! I don’t really make soup during the summer months but I could definitely get on board with this! This is summer perfection! I’d love a bowl of this after a long day of fun in the sun! Thanks so much Laura! Definitely great on a hot summer day! Such a great recipe idea to finish out the summer! Love it, can’t wait to try it! Thanks Christine! Hope you get to enjoy it before summer ends! Thanks Abbey! Hope you give it a try! Holy gorgeous tastiness! This is definitely on my list to make before summer comes to an end. Haha thanks Melissa! Hope you enjoy it as much as we do! I went to Spain last summer and got totally hooked on gazpacho but I’ve yet to make it this year! This delicious watermelon version is going to have to make it on next week’s menu! I love Spain and all Spanish food! Cannot wait for you to make this Whitney! I’ve never tried gazpacho of any kind before. It sounds yummy, though. You must try it Raia! I’m super interested in making the relish. It sounds delish. I wonder what other things it would be good on? It’s really yummy! Would be good on burgers (fish, beef, turkey), grilled chicken, white fish of any kind…Lots of things. Let me know if you give any a try! I’m with you on this one- I wasn’t always the biggest fan of cold soups but now I love them, especially in the summertime! I love the combination of sweet and savory ingredients in this. So refreshing! So glad you feel the same way Sonali! Let me know if you make this one! I need to try this. I’m not usually a gazpacho fan but this looks good. Watermelon gazpacho sounds awesome!!! The perfect, refreshing summertime soup! Thanks Emily! It sure is! Truth be told, I’ve never been a gazpacho fan. But the watermelon factor intrigues me – it must cut in nicely to the acidity of the tomatoes. I get that – it really is a love/hate food! But I do think the watermelon balances it out some and makes it more palatable to those who aren’t as into the acidity of the traditional version. You’ll have to let me know if you try it! This needs to happen before summer is gone! Looks so fresh and delicious! The best flavors of summer in a bowl! Yes it sure does Taylor! You will love it! I definitely did not know what gazpacho was until a few years ago! Love the watermelon addition! Did you like it when you found out?! Hope you enjoy this one! WOW this gazpacho looks so refreshing and perfect for the summer! Can’t wait to try this recipe! Such a great idea for hosting too! Thanks so much Natalie. Hope you enjoy it! Ooh I love gazpacho in the summer and the flavours of this sound incredible! Definitely going to have to give this a try! Let me know when you do! Thank you! Sounds like the perfect thing for summer! It sure is! So refreshing and delish! I’m a soup girl and a recent convert to gazpacho! This sounds so light and fresh, I can’t wait to try it! Yay for soup girls and loving gazpacho! Can’t wait for you to try it! This sounds so deliciously refreshing, a lovely combination of flavours and perfect for hot summer days. Like you I never ‘got’ the cold soup thing until recently – I was served some chilled pea & mint soup and was very wary but it was absolutely stunning and I’m a convert! Thank you so much Kate. So glad you got into cold soup now too! Pea and mint is such a delicious combo! What a refreshing soup! I bet you could find this on cruise ships it’s so gourmet sounding. I love cold soups. Thats where I had my first one on a cruise I will love this one!